The selection on this album are intended to please not only Blues and Folk fans but all those of the new breed who are just taking up modern music. I get many requests for guitar pieces from "classical" listeners, so I have included a few finger-busters for them. The two pieces by Oliver Hunt and Stan Watson respectively have never been recorded before. And the adaptation of the Purcell hornpipe is entirely my own. For the next album, there is a Latin piece I would like to do, and also a 14th century pavan for guitar: but we can discuss these at a later date. There are also two Muddy Waters' numbers here (both actually written by Willie Dixon, the giant bass-player who resided at the "Trois Mailletz" in Paris with Memphis Slim in the mid sixties.) And there are two songs from Paul Simon. Paul is a good friend of mine and these are two of his best. The aim on all my discs, as you know better than anyone, has been to make "music" a sufficient attractive title in itself, and to draw some of those music lovers who previously though Jazz and folk-forms and classical things to be irreconcilable elements. And I predict there will be many more musical revolutions in the near future. I myself would like to explore spirituals a lot more in the next few years. And- if I get the time - I would like to follow up two more projects. One is another trip to the East. Another is an album of some 'pop' flavor of mine, backed by an orchestra. Pieces like "No Milk Today", Rigby. "A Whiter Shade of Pale", "Daydream" and something featuring electric blues guitar - dig Lonnie Johnson on "Drunk Again" by the way. 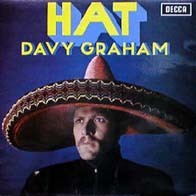 There's no such thing as a bad Graham album from the 1960s. While Hat isn't necessarily the first one you should dig into, it offers the standard pleasures that you expect from his records: excellent, feverishly imaginative acoustic guitar playing; vibrant jazz-blues arrangements; and covers of blues numbers, Paul Simon, and Lennon-McCartney. He's just as capable of good-time blues ("I'm Ready") and a folk cover of "Getting Better" from Sgt. Pepper as dark, slightly dissonant instrumentals with a modal/Eastern flavour. As is the case with most of his '60s albums, it's very hard to find, especially in the U.S., where Graham did not have a record deal. The two lads who wrote this show a definite promise. It's a optimistic sing. I like it. Long the property of Jimmy Witherspoon. I first learnt it from the British blues singer, Redd Sullivan. By Willie Dixon, and sung byMuddy Waters. A real city blues, Chicago-type. A composition by the great jazz drummer, Art Blakey. He spent a number of months in Africa, studying the kind of rhythms, which underline this piece. By Paul Simon, most of whose songs are as eloquent as poetry. This one is a genuine 'on the road' chronicle. Part of a 3-part suite for harpsichord by Henry Purcell: Prelude, Air and Hornpipe. Another Willie Dixon. As much a country blues, medicine, an in style, as an intimate city blues. A composition by the elusive and talented Stan Watson, a jazz and classical guitarist, and I learnt it from him without it having a title. Certainly the strangest of murder ballads. Appalachian in origin, and usually accompanied by a banjo. There were some Scots immigrants to these mountains about a hundred years ago who hardly mixed at all with the settlers - consequently their music has a strong modal conception, and "Pretty Polly" is no exception. Adapted from one of A.L Lloyd's collected tapes of Bulgarian music. A Turko-Arabic feel has crept unto it, however, turning it into a dance. A highly individual statement, reminiscent of Nietzsche's lonely hermit, voices spanning the mountaintops. A piece in the style of the 16th century by the modern composer and teacher, Oliver Hunt.